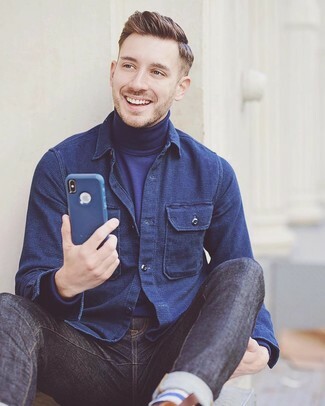 If you're on the hunt for a casual yet stylish look, consider teaming a Topman stripe sleeve shirt jacket from Nordstrom with navy jeans. Both garments are totally comfortable and will look great together. Add a more relaxed vibe to your outfit with white leather low top sneakers. 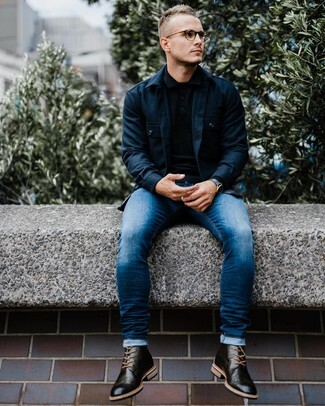 This pairing of a Topman navy shirt jacket and black skinny jeans is super easy to do and so comfortable to wear throughout the day as well! If you wish to effortlesslly rev up this ensemble with shoes, introduce black leather casual boots to the equation. 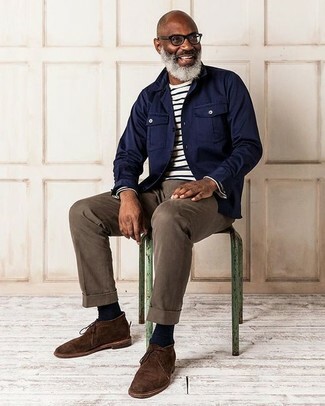 A navy shirt jacket and navy jeans will convey this neat and relaxed vibe. 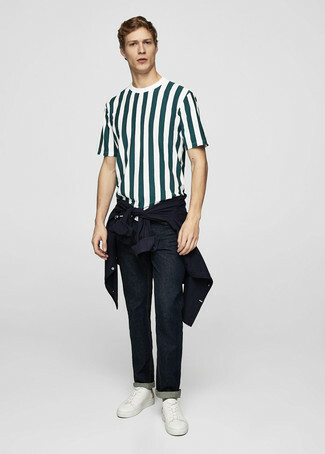 If you're looking for a casual yet seriously stylish outfit, marry a Topman stripe sleeve shirt jacket with blue vertical striped jeans. Both garments are totally comfortable and will look great paired together. 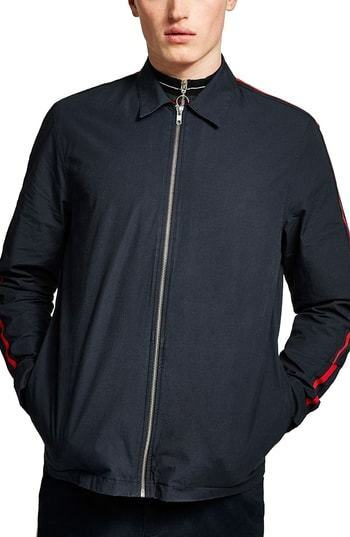 Wear a navy shirt jacket with blue skinny jeans to create a truly stylish and current laid-back outfit. If you want to feel a bit more sophisticated now, complement this getup with black leather brogue boots. 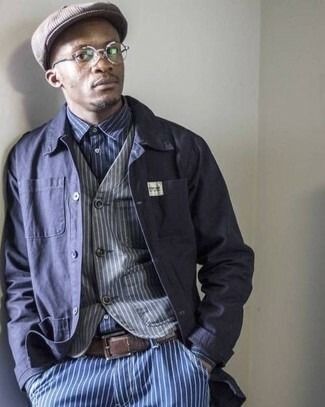 Hard proof that a Topman navy shirt jacket and olive dress pants are amazing when paired together in a refined ensemble for a modern dandy. Brown suede tassel loafers pull the outfit together. 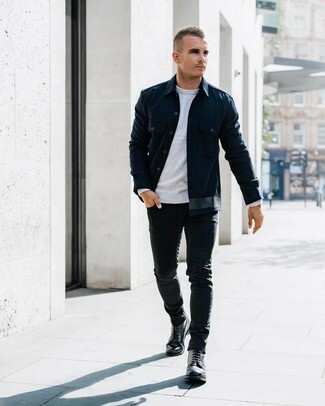 To pull together a casual ensemble with a modern take, consider teaming a navy shirt jacket with black jeans. A pair of dark brown leather derby shoes effortlesslly revs up the classy factor of your outfit. So as you can see, being a dapper dude doesn't require that much effort. Just try pairing a Topman stripe sleeve shirt jacket from Nordstrom with brown chinos and you'll look good. 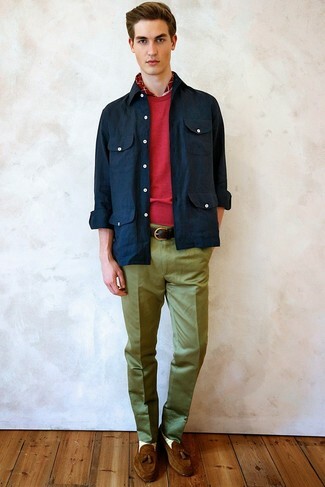 Finish off this getup with dark brown suede desert boots.